Here is the AWESOME prize that we have to give away today! 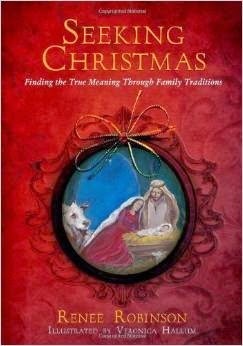 My beautiful and talented friend, Renee Robinson, has published an incredible Christmas book. I read it last year, and plan to read it every Christmas with my family. harder each year to celebrate what really matters? Do you wonder if the real message of Christmas is getting lost in the shuffle between parties, gift exchanges, and pageants? Seeking Christmas is a series of family devotions and guided, hands-on activities that give your family meaningful traditions, rich experiences, and treasured memories. Renee's writing is inspiring to say the least. Hop on over to her website and browse some of her posts. You will absolutely be hooked on her writing. She's gifted with much wisdom. In the meantime, be blessed by a post she wrote recently about how we can serve others this Christmas. Grab a cup of coffee and enjoy! Pack shoeboxes for Operation Christmas Child- This is one of our favorite traditions. Each of our boys likes to pack their own shoebox. Many Chick-fil-A locations even have a day to drop off boxes in exchange for a free sandwich coupon. Visit a nursing home- One year we visited the nursing home and just walked around visiting the residents while they ate lunch. This was very uncomfortable for me but totally comfortable for my husband. He didn’t hesitate to hug people he didn’t know, and I couldn’t believe how open and receptive the residents were. They loved seeing our boys. Andrew was about 2 at the time, and he easily hugged the necks of strangers and they hugged him right back. Other times we have purchased small gifts such as slipper socks and warm hats to hand out to the residents. Adopt a family- Many local charities offer ways to adopt a family in poverty that cannot afford to provide gifts at Christmas. This is a wonderful way to lessen what you might spend on your own family and allocate to a family in need. Children can be very involved in this by selecting the gifts, making cards, and wrapping presents. Pack military boxes -Brave men and women serve our country so we can enjoy the freedoms and safety we enjoy. They sacrifice their lives for us. For many in the military, they will not be with family like we may be. Sending a little care package is a tiny way to say thank you for all they do for us. Random acts of kindness- everyone loves this, especially kids. It’s a fun way to be a secret santa. There are hundreds of random acts of kindness you can find online. Day of prayer- choose a day and a charity or need that God places on your heart and spend the day praying. Prayer changes situations more than anything we can ever do. It shouldn’t be overlooked. Prayer is the best act of service we can offer, and this is something we can model no matter the age of our children.